Every time we have friends or family round for dinner I always try a new Canape recipe, everyone seems to love them, so I now make them on arrival night on our French Alps walking breaks. My favourite Canape Recipe to make is a Palmier, it’s so easy and you can choose many types of fillings to put in them. For my recipe of the month I have picked the two most popular big favourites with walking holiday guests and friends. Christmas is a great time to make Canapes; they are especially good with a glass of bubbles. SO ENJOY. Roll out the puff pastry to a large rectangle. Spread the goat’s cheese over the pastry. Roughly chop the peppers and walnut pieces, and then sprinkle over the cheese. Roll up one edge of the pastry into the centre, and then repeat with the opposite edge to meet in the middle. Cut into 20 slices, place on a baking tray and bake for 10-12 mins until golden. Put the puff pastry on a well-floured surface and bash it with a rolling pin. Usually you need to be quite delicate with puff pastry as it needs to puff up a lot, but for palmiers it only needs to puff up a little. Roll the pastry out into a rectangle about 30 x 35cm/12 x 14in and the thickness of a £1 coin. 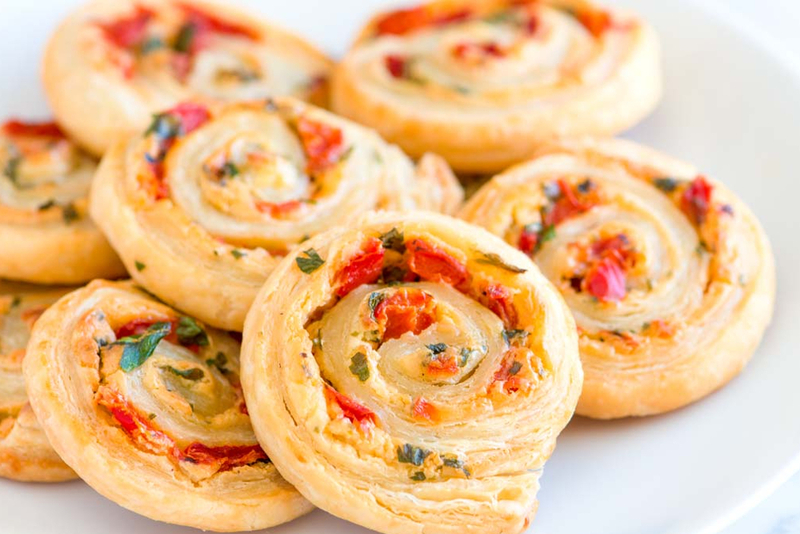 Spread the tomatoes over the puff pastry and sprinkle over the rosemary. With the shortest end facing you, take both long edges of the pastry and roll them towards each other to meet in the middle. Brush a little egg down the centre to stick the two halves together. Carefully lift into a large baking tray (making sure it will fit in your fridge first) and put in the fridge for at least 30 minutes to chill and harden. To serve, pile them high on a plate. This is a great quick canapé recipe for waiting guests. This entry was posted in Blog, Christmas Time, Paula's Recipes and tagged ChaletMenu, Chamonix, FrenchAlps, Friends on 20th December 2018 by Pinnacle Walking-Holidays.